Now it is official, Sanity Falls is the most successful MadPea game ever. Despite the reduced visitor’s frequency in Second Life because of Easter holiday, Sanity Falls won 1.000 hunters in a tiny little bit more than 8 days. Madpea generously donated a prize of 1.000 Linden for the thousandth player. 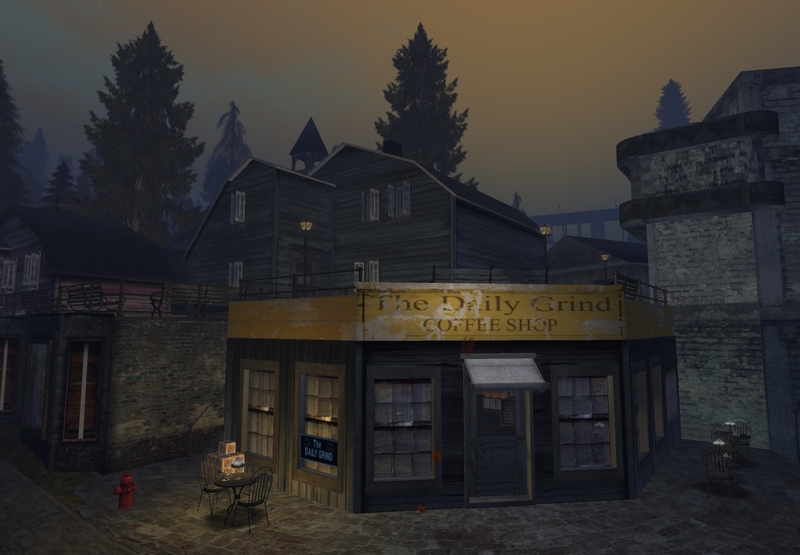 CandyDumont Resident was happily surprised when MadPea boss Kiana Writer told her the good news and met her for a tea in the slightly decrepit coffee shop of Sanity Falls: The Daily Grind. Candy told Kiana that she is a passionate hunter and became aware of the hunt by a sign in one of her favourite shops and participating vendor of the game: Grim. Bros.
Kiana Writer: You were our 1000th player for this game! Yayyyy! CandyDumont: I had no clue! CandyDumont: Thank you very much! Glitch Axelrad shouts: GRATS! .. Drinks on Candy! CandyDumont: Oh that's a lovely picture! Kiana Writer: have you started playing Sanity Falls yet, Candy? CandyDumont: Not yet! But I will be for sure. Kiana Writer: Can I ask, how did you hear about this game? CandyDumont: Oh yes. I'm excited about that. I adore interactive hunts! CandyDumont: lol to see if I made it out alive eh? Quan Lavender: You do a lot of hunts, Candy? Kiana Writer: ok, thanks so much for your time, Candy! CandyDumont: Thank you two ladies! Let’s see how long it will take Candy to finish the hunt. 199 already did as you can see at the ‘Wall of Fame’.